The two business areas of Erkners are located in the northern part of Erkner. The business- and industrial park TEWE is with 15 ha the largest business area in Erkner. The municipal business park around the Water Supply Station comprises 7 ha. The well developed traffic system and the location of the city, with the Freeway Exit No 6 Erkner within 2 km, the stop of the regional express RE 1 and the end station of the Metropolitan Railway S3, the intersection of the high ways L 30 and L 38, the distance to the State High Way B1 within 8 km and the directly adjacent city districts Berlin-Treptow / Köpenick, make a business settlement in the city of Erkner attractively. With regard to the infrastructure of the city, Erkner is a base center with part functions of a middle center with 18,000 m² retail trade areas, for short-term, middle- and long-term demands. 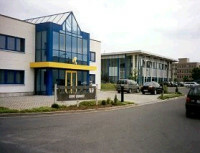 The assessment rate for tax amounts: 400 v. H.
The assessment rate for business tax amounts: 300 v. H.
The municipal business park around the Water Supply Station was supported with 50% by the Support Program "Partnership Task to Improve of the Regional Economic Structure" after the 19th frame work of the State Government of Brandenburg. The business park is to ca. 90% occupied, with industrial production business, craft business, services and trades. The areas of the business- and industrial park TEWE are currently occupied by 45%, through of sale and/or rentals and consist of similar branches like municipal business park. The Assessment Committee for plot of land values in the district Oder-Spree (Tel. 03366/ 35 17 10 - 12), confirmed 45.00 € as the basic guideline (€/m² amount) for commercial building areas in the Berliner Strasse und Woltersdorfer Landstrasse, dated 1. January 2006. In mixed building areas, the land value ranges between 37.00 € to 95.00 €, for residential building areas 108.00 €, for general residential areas 125.00 € and for general leisure time areas 18.00 € to 27.00 €. The ground guideline plan, further explanations as well as land market report are available from the expert / assessment committee.